Rather than look at just one state, I thought it might be interesting to see what Swingometer has to say about a national poll, and as it turns out, the most recent national poll is the tracking poll from Rasmussen Reports. This one is much better news for Mitt Romney than the North Carolina poll was. The result is Romney 48, Obama 43, which turns out to be a two-party split of Romney 52.7-Obama 47.3 (R+5.4). The actual 2008 popular vote was McCain 45.7, Obama 52.9 (D+7.2). Together, that’s a swing of R+12.6, a large change from 2008. Asking Swingometer, we find that a swing that large results in a clear win for Mitt Romney. He picks up Colorado, Florida, Indiana, Iowa, Minnesota, New Hampshire, North Carolina, Ohio, Pennsylvania, Virginia, as well as NE-2 and ME-2. It’s terribly early of course. It’ll be a while before we get other pollsters trying a likely voter model. But while we wait, what else do we have to look at? How much of that can be chalked up to Rosen’s stupid remark on Ann Romney? Or to the economy still struggling to recover? One thing I am concerned, as I’m sure you already know, is the fact that Romney is depending on external circumstances to tie or lead in the race with Obama. That’s never a good strategy to use. Romney is our nominee, but he has to step up and take the fight to Obama. Pretty good map. Romney gets 306, and Obama gets 232 EV. 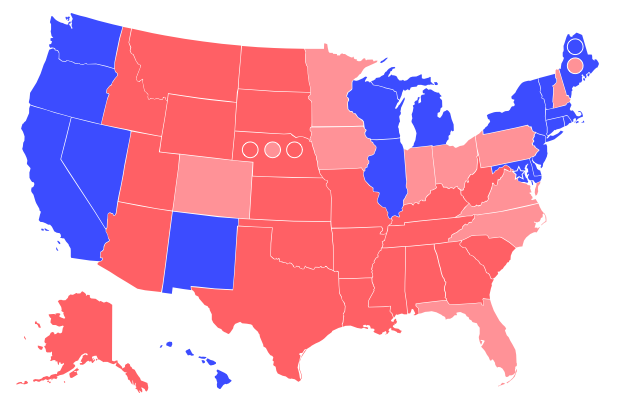 However, I think Wisconsin will swing, especially if Walker wins the recall (I don’t really see how otherwise), and we may win Michigan as well (big GOP swing lately and Romney’s supposedly got some pull there with his roots). Minnesota going Republican? Now that is interesting.